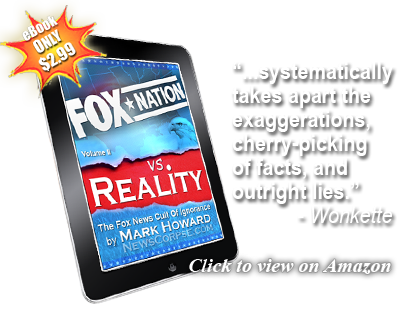 The journalistic fraud that is Fox News is well known. It’s a network that was contrived as a right-wing spin factory, but dishonestly marketed as being “fair and balanced.” They have a revolving cast of scripted characters who alternately play politicians and pundits. Often the same person in both roles. Their commitment to partisan deceit is rooted deeply in the foul culture nurtured by its founders Rupert Murdoch and Roger Ailes. However, a new investigation proves that ideological fraud is not the only unethical practice employed by Fox News. Following the scandal-driven departures of Ailes and Bill O’Reilly, a new cretin was crowned as the top Foxie. 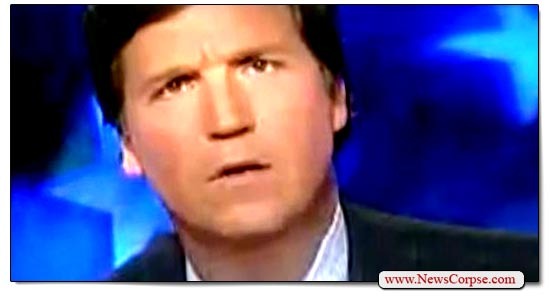 Tucker Carlson was awarded O’Reilly’s prized time slot that anchors the network’s primetime lineup. Never mind that Carlson has a record of failure on the three previous networks foolish enough to hire him. Fox News put all their faith behind Carlson. And he soon proved that he was totally undeserving. Last month, for the first time in seventeen years, MSNBC’s primetime beat Fox News. “Most of the roughly 50 journalists who produce content for the Daily Caller actually work for the Daily Caller News Foundation, a tax-exempt organization with 501(c)(3) status that is ostensibly separate from DailyCaller.com. The two entities share the same floor of the same Washington office, however, and virtually everything produced by the foundation — which accepted $3 million in donations in 2015, according to an IRS filing — appears on the for-profit website, which sells advertising on the articles. The unscrupulous business practices that Carlson employs are part of an established pattern. TDC was first bankrolled by Republican stalwart and notorious climate change denier, Foster Friess. He laid out $3 million to get the site off the ground. The Koch brothers were also generous with Carlson’s new venture. They contributed over $800,000 to the effort. More recently, Carlson enjoyed the benevolence of an even more prominent financier. During the 2016 presidential election, Donald Trump sought out Carlson’s help to reach out to conservative voters. Trump purchased the use of TDC’s mailing list to solicit both votes and contributions. The CMD estimates that Carlson took in about $150,000 for his services. So Carlson was feverishly promoting Trump, hosting his surrogates, and even interviewing him on Air Force One after the inauguration. However, he failed to inform his audience that he was paid substantial sums of money by Trump. It’s an unambiguous lapse of ethics that calls into question Carlson’s integrity and motives. Furthermore, Fox News is equally unprincipled for allowing Carlson to go on the air under these circumstances. But in neither case would anyone familiar with the Fox code of ethics be surprised. It’s just standard operating procedure for a network that was born to deceive. One of the favorite stunts that conservatives use to try to shame liberals is the “man on the street” interview. Generally they purposefully skew the presentation to reflect their preconceived prejudices. Any responses that fail to advance their point of view are left on the editing room floor. Then they release a video with six people who agree with them, but never tell viewers that there were sixteen others who disagreed but were cut out. 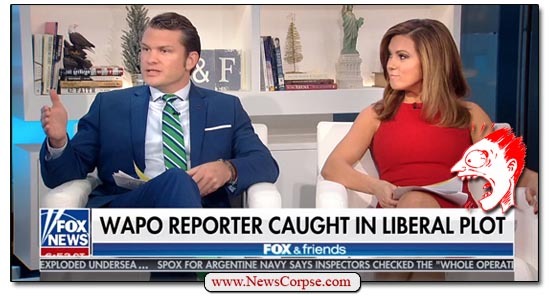 This week on Fox and Friends they featured a “reporter,” Cabot Phillips, from the ultra right-wing organization Campus Reform. He visited Harvard University in an effort to expose the alleged liberalism of the students and faculty. 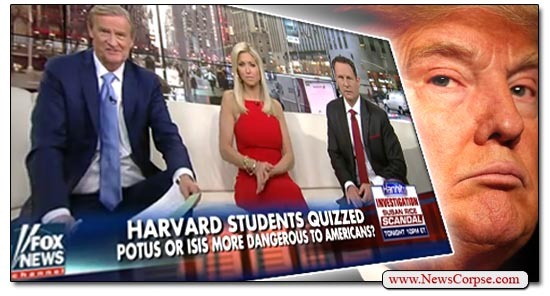 The question he asked was “Who is more dangerous to Americans, Donald Trump or ISIS?” Of course, he fully expected to find students who selected Trump, whom he would then try to make look foolish. That analysis was wholly constructed from his over-active imagination. Nowhere in the video did any student attribute their views to either Obama or their professors. And Phillips didn’t bother to interview any of the faculty to ascertain their views. What’s more, while Obama did once try to marginalize ISIS as a J.V. team, he also spent years outlining precisely the peril they pose. More importantly, he attacked them relentlessly, killing thousands of their operatives, including many of their leaders. Indeed, Trump has done more for hate groups in America who espouse prejudice and violence than any President before him. It is not coincidental that the KKK and white supremacists uniformly endorsed Trump and worked to get him elected. Trump’s rhetoric during his campaign and presidency has encouraged America’s bigots and increased the number of hate crimes. African-Americans, gays, Muslims, Latinos, and Jews have all been victimized in greater numbers in the Era of Trump. The harassment and assaults that Trump has inspired have a much more direct impact on the safety of Americans. That doesn’t diminish the horror of terrorist activity by ISIS. It’s just a fact. It is not, therefore, the least bit surprising that people consider Trump more to be dangerous with respect to their personal lives. A study by the CATO Institute last year revealed the relative dangers of common occurrences. Death by foreign terrorists came in 34th out of forty-eight items. Activities more likely than terrorism to be fatal included walking, choking on food, and police encounters. You are 260 times more likely to be struck and killed by lightning than by terrorists. You’re 129,000 times more likely to die in a gun assault. Not mentioned in this video were risks posed by Trump’s actual policies. The president’s erratic behavior makes him a poor choice to be in charge of the nuclear codes. And his anti-environment stance could result in millions of lives lost due to famine, drought, extreme weather events and war. Taking a logical approach to the question, it’s clear that Trump is potentially far more dangerous to America and the world than ISIS. He commands a much bigger military with far greater resources. The video is a blatantly partisan sham by conservative activists. Campus Reform is a project of the uber-rightist Leadership Institute that receives much of their funding from the Koch brothers. Their alumni includes hacks like Mitch McConnell, James O’Keefe, Ralph Reed, Karl Rove, and even Vice-President Mike Pence. That’s a fraternal order that speaks volumes as to their political and ideological mission. And it’s why Fox News devotes segments to their lies on a regular basis. Since the day that Donald Trump was inaugurated, the American people have flooded the streets and town halls to express their opposition to his agenda. Unprecedented numbers of citizens turned out for the nationwide Women’s March on January 21. A week later, more protesters showed up spontaneously at airports to oppose Trump’s Muslim ban. Now town halls are being inundated by angry voters who won’t stand for Trump’s efforts to gut ObamaCare. These protests are having a profound effect on the Republican Party. Nervous GOP representatives in Washington, and across the nation, are running scared – literally. 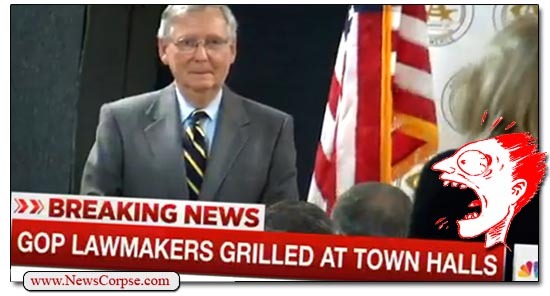 Many are avoiding their own constituents meetings for fear of encountering their wrath. And the ones that are going are being greeted by passionate advocates for progressive policies and values. Setting aside the odd reference to “alleys,” Trump just confessed that he’s only interested in what Republicans have to say. He continues to prove that he’s a divisive, partisan politician with no interest in having a productive dialog. The extremists in Trump’s administration are determined to steamroll their agenda of hate and elitism through a rubber-stamp congress. Unfortunately for them, the American people do not seem willing to allow it. And if we keep the pressure on, we can stop them in their tracks and replace them in 2018. Forward. Seeking to prop up Donald Trump’s frantic and baseless cries of a “rigged” election, Fox News has their fiction writers working overtime. This morning on Fox & Friends the “Curvy Couch” potatoes invited Betsy McCaughey to expound on a new theory. McCaughey is best known for having coined the term “death panels” which Sarah Palin made famous. It became PolitiFact’s “Lie of the Year“ for 2009. Sounds scary, doesn’t it? And it would be except for the fact that none of it is true. 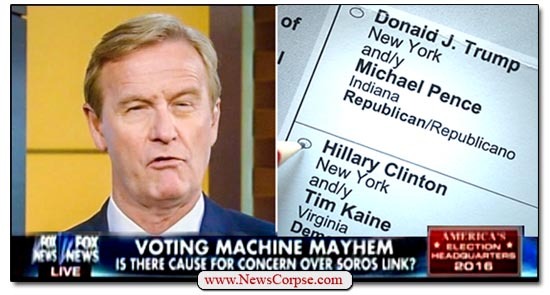 Soros has no financial involvement with Smartmatic whatsoever, and never has. The actual owner sits on the board of Soros’ Open Society Foundation along with dozens of other board members. That hardly equates to a direct connection to the voting machine manufacturer. But that didn’t stop distraught Trump supporters from launching a petition on the White House website demanding that Congress “meet in emergency session about removing George Soros owned voting machines.” At the time of this writing it had 89,000 signatures, on its way to a goal of 100,000. However, that’s not even the most ridiculous part of this lame attempt at scandal mongering. The Smartmatic machines in question are not being used in the United States at all. Not a single one will be used in any state in the 2016 election. So Fox News, and nearly 90,000 crackpot conservatives, are incensed and determined to rid America of something that doesn’t exist. To be clear, McCaughey is now criticizing the Super PACs that were set loose by the Supreme Court’s Citizen’s United decision. Welcome to the progressive movement, Betsy. Liberals have been fighting that decision for years. But don’t expect her to have the same sense of outrage over the Koch brothers or the many other financiers of right-wing PACs. For the record, Soros’ own son started a Super Pac to end Super PACs. What we can expect is for Fox News to get ever more absurd with far-fetched fairy tales in the few remaining days of this campaign. They are desperate and morose and ready to fling themselves off of rooftops. So maybe they can be forgiven for exhibiting signs of acute dementia. As this wacky election season continues to spiral out of control, the sound of an increasingly impotent Republican Party scratching at the door is becoming ever more noticeable. 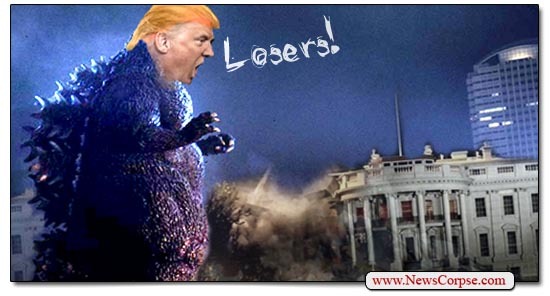 The so-called establishment candidates are falling to the wayside as a creature manufactured by reality TV lumbers across the GOP landscape, flattening its hopes like cardboard models being trampled by a carrot-topped Godzilla. Well, that ought scare the savage Trumpzilla into bowing to the supremacy of the party that he has been running against for eight months. The lunacy that Priebus thinks Trump cares about the RNC’s “resources” is almost as absurd as his belief that Trump would ditch his potty-mouth politics, or that he doesn’t already espouse the wingnut policy goals of the party at large. If Trump cared about partnering with the RNC he would not be repeatedly threatening to abandon the party and run as an independent. He wouldn’t be accusing them of distributing illegal solicitations. He wouldn’t be criticizing their debate audiences as being deliberately stacked against him. Even setting aside the hostility that exists between the RNC and The Donald, the GOP’s services are not exactly state of the art. Last year it was revealed that the Koch brothers were building their own campaign machine that includes many of the services that are typically performed by a political party. The Koch operation was said to be angling to replace the party’s electoral architects by building and distributing the voter access tools and outreach capability. With the Koch’s running election services and Fox News running PR, you might be wondering what purpose the RNC serves. A lot of political operatives and analysts are wondering the same thing. Under the direction of Priebus the party has become less of a factor than in previous years. It has struggled with Trump’s candidacy from the beginning when his refusal to rule out a third-party run resulted in a loyalty oath that all candidates were required to sign (and which Trump has already hinted he might break). It would be wishful thinking to imagine that Trump would suddenly buckle under to a weakened GOP that’s begging him to play nice. 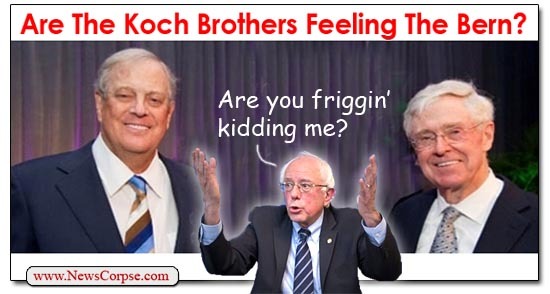 Is Tea Party Godfather Charles Koch Feeling The Bern? The Washington Post (you know, that bastion of the so-called “liberal” media) just published an op-ed by Charles Koch of the infamous Koch brothers. The headline declared that “This is the one issue where Bernie Sanders is right.” While that’s a fairly generous admission, it is hardly representative of Koch’s actual worldview. While criticizing policies of both parties that “helps perpetuate a cycle of control,” Koch also took the opportunity to lash out at the regulations that have been a staple of his anti-government agenda. And he remains opposed to the sort of reforms that make it possible for people rise out of poverty (i.e. 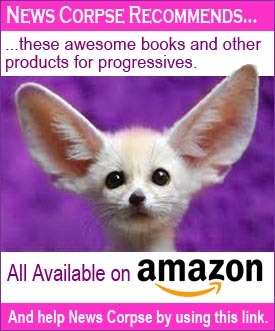 ObamaCare, unions, increasing the minimum wage, non-discrimination in employment, parental leave, etc.). Despite the facade of a conciliatory partner in advancing the interests of all Americans, Charles Koch and his brother David are devoted to the fraternity of the one-percent to which they belong. They enjoy the fruits of income inequality. They are ardent foes of environmental protection and programs to mitigate climate change. Even worse, they would abolish the EPA, even while their businesses are among the worst toxic polluters in the nation. They favor privatizing Social Security and Medicare. They create media front groups to spread right-wing propaganda. And they are the biggest supporters and beneficiaries of Citizens United. In addition to all of the above, the Koch brothers virtually created the Tea Party. Groups like FreedomWatch and Americans for Prosperity are nothing more than surrogates for the disgruntled goofballs who dress up in tri-corner hats and carry racist signs with pictures of President Obama as a witch doctor. The Koch brothers have invested multi-millions of dollars in the Tea Party in an attempt to crush Democrats and replace them with the sort of hard-line, right-wing extremists that have produced gridlock in Congress. They lust for shutdowns of government even if it means sinking the economy or denying healthcare for 9/11 first-responders. This article is just another component of their campaign to rehabilitate their public image, cleverly referred to as “The New Koch” by Jane Mayer of the New Yorker. But, they are just as committed to their wingnut agenda as ever. They announced that they will spend nearly a billion dollars in the 2016 election cycle in support of conservative Republicans who promise to dismantle the government, leaving them free to pollute the planet and plunder the economy. So don’t let this faux Valantine to Bernie Sanders fool you. The Koch brothers are what they have always been: John Birch Society Libertarians with strong Ayn Rand leanings. The Republican presidential primary has utterly devolved into a festival of crotchety buffoons whose most steadfast goal is to attract more publicity than their current front-runner, Donald Trump. However, it says something rather pitiful about a collection of GOP candidates that are repeatedly upstaged by a boorish TV reality show host. That’s gotta hurt. Consequently, every so often one of them will take a wild swing for fences to see if they can sponge up a little attention. Doing so almost never involves contributing something meaningful to the discourse on government, politics, or society. No, it usually means sinking to lower levels of dumbfuckery than Trump himself. And the latest contestant to step up to the plate is Sen. Ted Cruz, who in the pre-Trump era was the undisputed champion of the lunatic fringe. Speaking at gathering of wealthy Republican donors sponsored by the wealthiest of them all, the Koch brothers, Cruz addressed the subject of Climate Change. He began by making the bizarre assertion that the vast majority of scientists whose studies prove that Climate Change is a real and imminent threat, are “Flat-Earthers.” That’s right, he used the phrase that ordinarily mocks those who reject science against actual scientists. And he used it to reject science. Indeed. Science should follow the facts. And with 97% of scientists who have studied Climate Change agreeing that it is real and is caused by humans, the facts are not in doubt. What’s more, Cruz’s complaint about the “language of theology” comes entirely from his warped imagination. The term “deniers” was previously used mostly with reference to fake historians who claimed that the Holocaust never occurred. That is not a theological reference. And I would wager that Cruz could not cite a single instance of someone referring to Climate Change deniers as heretics. As for Cruz’s claims about satellite data, cooked books, and the alleged absence of any recorded warming, he is obviously working from materials provided by the same Exxon lobbyists who previously worked for cigarette companies on the health benefits of tobacco. Because if he had asked the scientists at the National Oceanic and Atmospheric Administration they would have told him that the planet has been steadily warming for decades and that 2014 was Earth’s warmest year on record. And that 2015 is on track to surpass 2014. 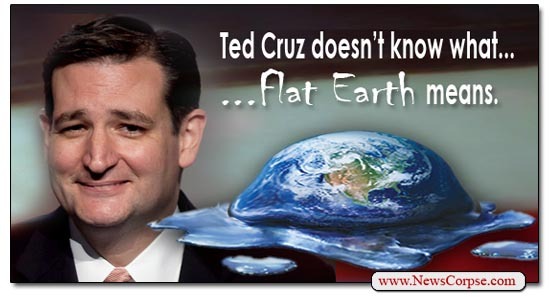 This isn’t the first time that Cruz has wondered from the realm of reality by flipping the concept of flat-Earthers. Back in May he said much the same thing while adding that he and other science-deniers were modern-day Galileos. The only problem with that is that it is bass-ackwards. Galileo was persecuted for advocating theories derived from scientific method (like the 97%). His critics, mainly the Catholic Church, rejected his work because they were committed to preserving long-held myths that benefited the status quo (like Koch brothers). So Cruz assuming the mantle of Galileo is a complete reversal of logic. He’s the one using an unsupported belief system to supplant today’s Galileos who rely on actual science. Perhaps the funniest diversion from sanity in Cruz’s speech was his ludicrous reasoning for why Democrats are pursuing Climate Change as an issue. First, he says that they plan to use it as a means to assert total control over … EVERYTHING! It’s all part of a grand conspiracy that concludes with universal slavery to environmental dictators forcing people to live with clean air and water in a habitable climate. The fiends! And even worse, Democrats only pretend to care about the issue in order to please the army of environmentalist billionaires (we all know how numerous and bloodthirsty they are) and to gain access to their campaign donations. Keep in mind that Cruz was offering this ominous conspiracy theory to a room full of some 450 wealthy campaign donors assembled by the Koch brothers from whom he is seeking donations. The only question for Cruz is, is this blockheaded stunt crazy enough to steal back some of Trump’s thunder? In ordinary times it would have more than sufficed. But these are not ordinary times. Trump has advanced the idiocracy to new, unforeseen heights. If Cruz really wanted to clinch the deal he should have accused the scientists of aiding and abetting ISIS, or thrown in a reference to environmentalist Nazis like Mike Huckabee did with Planned Parenthood. Now that’s how you out-Trump Trump. Everyday there is more and more evidence that the Republican Party is dissolving into the ether of a new political atmosphere. It began with Fox News usurping the PR responsibilities of the party. For anyone to advance in the GOP they had to go through Fox News. At the same time, the Koch brothers have been moving in on party operations and raising more campaign money than the party could ever hope to. Fox has corralled a stable of the most disreputable, unqualified, extremist, lunatics ever assembled, and is presenting them as experts, analysts, and leaders. 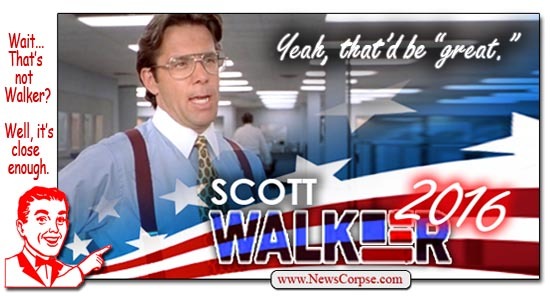 These third-rate icons of idiocy are marketed by Fox like any other gag gift (i.e. pet rocks, plastic vomit, Sarah Palin, etc.). […] The problem is that by elevating bona fide nutcases, they are debasing honest and informed discourse. The mental cases are crowding out any reasonable voices that might exist amongst the more moderate Republicans (if there are any left). Fox appears to have made a tactical decision to permit the inmates full run of the asylum. […] So even as this helps Rupert Murdoch’s bottom line, it is making celebrities of political bottom-feeders. That can’t be good for the long-term prospects of the Republican Party. 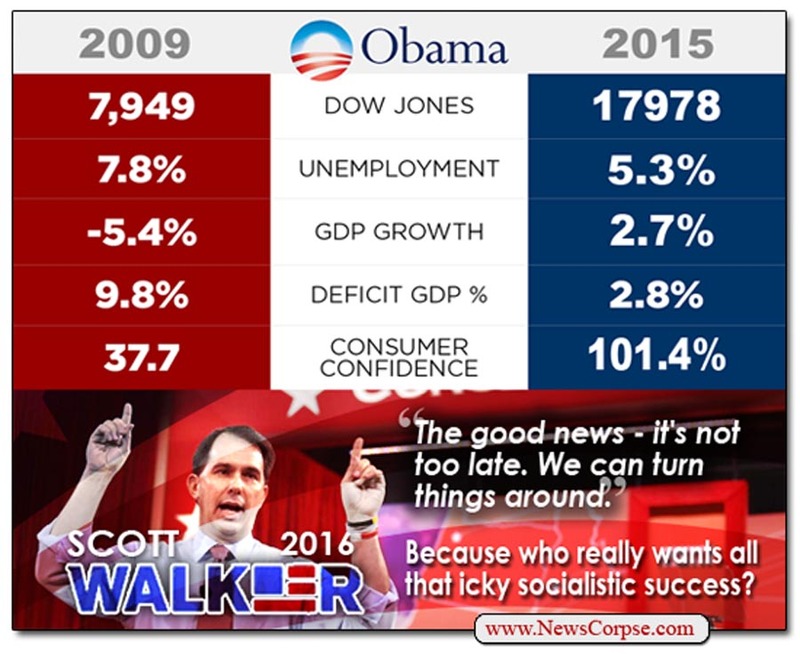 The trend is accelerating as we go into the 2016 presidential campaign season. Now Fox has appointed itself the gatekeeper of the GOP primary, wherein they will only permit the top ten Republican candidates, as determined by certain unnamed polls, to participate in their televised debates. Even Republican party operatives are opposed to this power grab by a media company. In addition to Fox News assuming the roll of party spokesman, the billionaire Koch brothers are angling to replace the party’s electoral architects by building and distributing the voter access tools and outreach capability that used to be the sole province of the political party. Yahoo News published an in-depth investigation that shows how the Koch’s syndicate has moved in on party territory, much to the consternation of the party chieftains. “The RNC is now openly arguing, however, that the Kochs’ political operation is trying to control the Republican Party’s master voter file, and to gain influence over — some even say control of — the GOP. So if the Koch brothers end up running the electoral operations of Republican candidates, and Fox News continues its role in media strategy and execution, the only question that remains is: What’s left for the remnants of the Republican Party to do? They become an organization with no authority, responsibility, or relevance. If they don’t take steps to reverse these trends, and do it soon, the GOP will drift into an ignoble and faded history. Ordinarily, that might not seem like such a horrible idea. 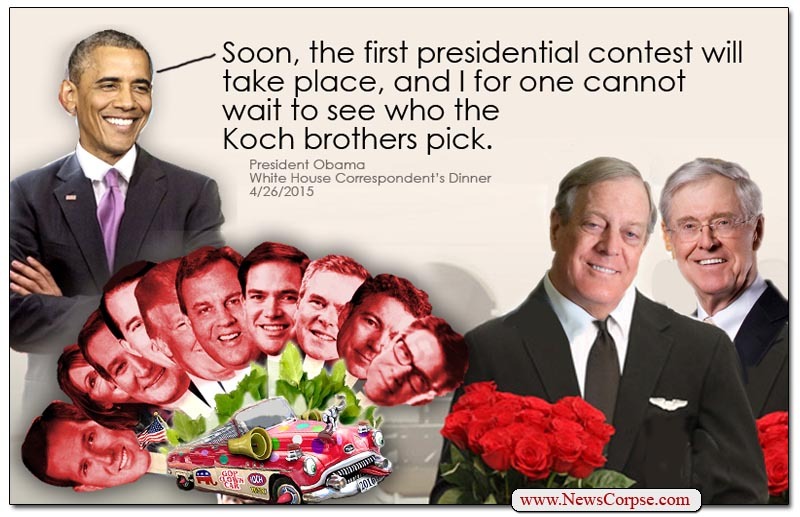 But if their replacement is Fox News and the Koch brothers, we might all be better off rooting for the GOP.